The first recorded case of leprosy in modern times was reported to the health authorities in the Irish Republic earlier this year, it has emerged. The patient is a Brazilian who has been living in Ireland for several years. 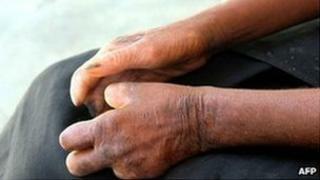 He had suffered a recurrence of his leprosy having first contracted it in Brazil, 10 years ago. Dr Connor Gallagher said it was a case that "one might have expected to encounter in the Middle Ages - not in a busy surgery in County Meath". The GP registrar who examined the man said he suffered from tuberculous leprosy or sarcoidosis. "The risk of contagion in new cases is small. However global eradication in recent years has proven difficult," he wrote in a medical magazine. He cited drug resistance, a poor understanding of the disease and persistent social stigma in developing countries as contributory factors to this. Leprosy, or Hansen's disease, is caused by the bacterium Mycobacterium leprae. India has the highest number of infections, followed by Brazil. Leprosy is difficult to contract and it is not known exactly how it is transmitted - although prolonged close contact with an infected person is needed. An estimated 95% of the population are naturally immune to the disease. To avoid antibiotic resistance, leprosy is treated with multiple drugs over a period of 6-12 months. In the past two decades, global prevalence of leprosy has been reduced by almost 90%. The article was compiled by Dr Gallagher and Katie McFaul, a specialist in infectious diseases for the Irish GPs' magazine, Forum. They said that while the diagnosis might seem extraordinary in terms of an Irish GP practice, it was an "interesting example of the sort of tropical illnesses that can occur in an ever-changing, multi-cultural Ireland." "As we open ourselves to global travellers, we can expect to see more global health complaints," they wrote. The authors said it is believed that about 95% of people have a natural immunity to leprosy. The Irish Health Service Executive (HSE) has confirmed it was notified about the case in January. Leprosy was not designated a reportable infectious disease in Ireland until last year. "Leprosy is not highly infectious. It is transmitted via droplets, from the nose and mouth, during close and frequent contacts with untreated cases. M. Leprae (Leprosy bacterium) multiplies very slowly and the incubation period of the disease is about five years," an HSE statement said. "Symptoms can take as long as 20 years to appear. Leprosy is curable and treatment provided in the early stages averts disability." In Northern Ireland in 2007, a man living in County Armagh was diagnosed with the disease. He believed that he contracted the illness when he was living in Indonesia. He was treated for the condition in London. Leprosy was common in Dublin in medieval times and in the 14th Century a leper hospital was built near St Stephen's Green. It was later moved out to the Dublin mountains - the area where it was sited became known as Leopardstown.